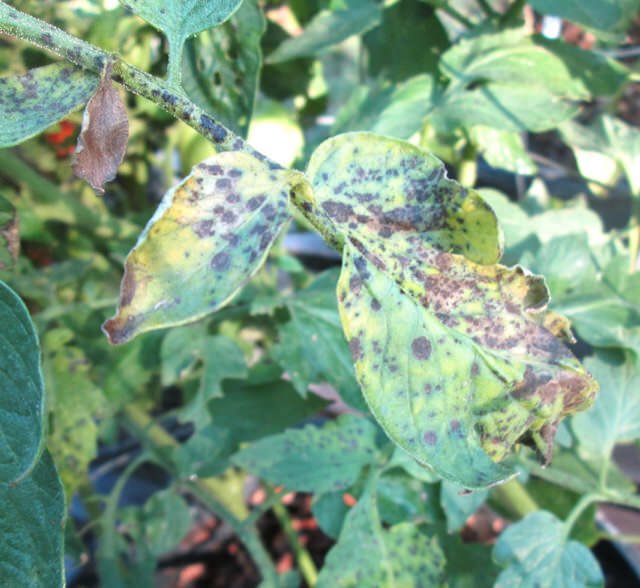 Tomatoville® Gardening Forums Index > We're Here For The Tomatoes!™ > Common Garden Diseases and Pests > Bacterial Spot? 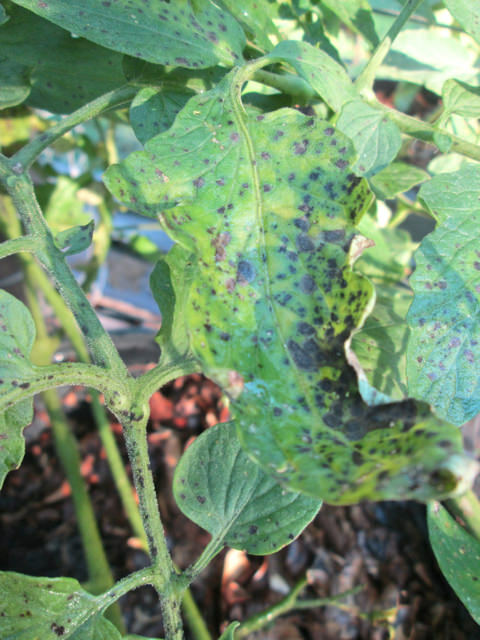 After cruising through pics here and elsewhere online, I think one of my potted tomato plants has bacterial spot, something I've not encountered before. The plant is just setting fruit (maybe 1.5-2" diameter) and no problems on those yet. I see in one photo the spots are even on the stems. Opinions? If it's bacterial spot, I've read that copper is basically a preventative and still not 100% effective. In fact, if used too often the bacteria can become resistant. Fungicides are pretty much just that, for fungi. Since it hasn't spread to the three neighboring plants, maybe try the bleach spray as a last resort? Or just toss it and be done with it? Looks like it could be the fungus alternaria. I haven't reviewed the bleach treatment thread to see if it would be of use. That would be my first thought as copper would be a last resort given the stage of growth, hopefully others will follow suit. I am certainly no expert on how to tell one of those spot diseases from another but every season in the fall this type spot problem seems to show up. Right now most of my tomatoes have something similar along with some EB but since it is so late in the season I don't see much upside to doing a lot of spraying to control it. If it weren't so near the end of the tomato year I would try the bleach spray along with a follow up of copper and or Daconil a day or two later. One thing for sure, later season is a time to be ruthless with any diseased leaves or stems. Everything you leave around will eventually spread to others and ruin your fruit too. If you can remove all the sick bits and still keep your fruit on, that might be a first step. I read that bacterial spots spread by splashing, also it does gross things to the fruit, unlike many fungal leaf diseases that are not likely to affect fruit unless moldy plant parts are in contact with it. Either way it's a risk to your healthy plants especially if any rain coming.